Pendragon Variety: In Memory of Dragons - Live at Amazon! Pendragon Variety presents "In Memory of Dragons," a themed speculative fiction anthology dedicated to the memory of Anne McCaffrey. Forward by Cat Rambo and stories by David B. Coe, Sam Schreiber, Matthew Healey, Melissa Prange, Cindy Ray, Rachel Bellairs, and Lauren Harris, with a dedication by Rosemary Tizledoun and afterward by Michelle "Mica" Ristuccia. Visit our website at http://www.pendragonvariety.com for more information. We'll let you know when the book is available for purchase elsewhere. We are working on meeting Smashwords' requirements for distribution in their premium catalog, at which point it would be available at most online retailers. Ebook Release: "Pendragon Variety - In Memory of Dragons"
Pendragon Variety, the podcast for aspiring genre writers, which I have been a cohost in for - wow, have we been running three years? 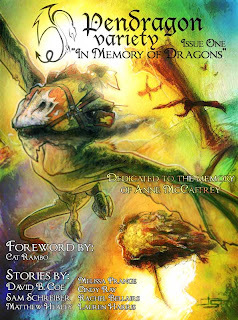 - is releasing its first publication, an e-magazine dedicated to the memory of Anne McCaffrey. The magazine will later be released in audio as a serialized podcast. Not only am I quite pleased to announce our first e-publication, I am extra tickled to put this down as an example of my ebook formatting services, which you can learn more about by clicking the Ebook Service tab above.